Getting hired in the company, working in the position always dreamt of would be something different, but actually while processing through some job interview in the company, the main issue that goes around each and every candidate’s mind is that what would be the salary package? It may seem awkward thinking about it, but it’s like a voice over which keeps playing unless the employer discusses about the package. Moreover, this salary package matters the most than the position. In this article, we discussed on how to negotiate salary during interview, job offer and hike below. 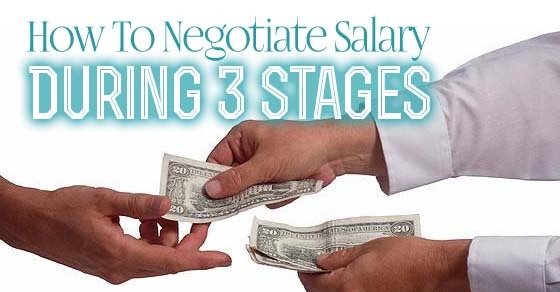 Negotiating salary during the interview is something that needs to be cleared before accepting or offering the job. If the candidate applied for the job is an experienced person, then it is obvious that he/she would appreciate better salary from his / her previous employers. That’s why it would be fair for each of the parties if they discuss the salary in advance. While attending an interview it is necessary to understand that a person who is interviewed by an employer can’t just go ahead and talk about the salary package they are providing. If the candidate gives some time for the communication level to go smoothly then it is possible that the level of comfort between them can let them both understand that what would be the correct time to talk about the salary package offered. During the interview process both the parties come to a situation where one needs to present the salary package offering to the perfect candidate for the job. And to do that, both the parties need to discuss the salary package expected and offered for both of them. While having such discussion the employer need to figure out the total package with benefits included that they are offering and at the same time the candidate need to figure out the total worth of his / her skill in terms of a salary package. Most of the time while attending the interview, it is possible that a candidate may expect a little much than what he/she used to get paid from their previous company. This happens when the candidate applied for the job has way better experience than any other candidates. Therefore, it would be advisable to the candidate that before presenting a gross figure in front of the interviewers, he/she must think of checking it twice for the gross reasonable figure. Most of the time it happens as while attending an interview the employer may present the gross salary that they can afford to provide for the candidate, but the candidate may not be comfortable with the total gross figure, and at that time after seeing such kind of look on the candidates face, the employer needs to provide a reasonable justification for the deal offered. Similarly, the candidate needs to come with a justification while demanding the salary package of that much higher salary or price. If a candidate needs a well-covered package from his / her recruiter then he/she need to keep in mind that, he/she needs to show the recruiter what he/she worth of. And to show that the candidate needs to demonstrate the value of his / her strengths and skills which will be beneficial for the company in their future activities. These kinds of demonstration of strengths and skills will definitely provide a fully covered salary package. When an experienced candidate applies for the job and expects a certain kind of salary package which would be better than his / her previous company, but the employer doesn’t seem to discuss about the salary package then the candidate cannot just right way discuss about the salary package that they are offering. It would be advisable for the candidate that they need to be patient and wait for the right time so that they can discuss about the salary package to make things clear from both the sides. There are different type of situations in the middle of the interview where the candidate is not supposed to discuss first about the salary package until he/she waits for the employer to make the first move. Similarly, after the job offer made, the candidate can casually put up the topic of salary package to make things clear. Therefore, there is some list of timing where the candidate and the employer can negotiate salary after a job offer. Once the employer made the final decision about the gross salary package, the candidate is supposed to give them their decision right away. It would be good if the candidate takes a little time for the decision. There may be a possibility that the candidate may not be comfortable with the final figures of the salary package. So it would be best for the both the parties if they take time for each other offers. And then decide whether to go for it or not. While negotiating salary offer or package related matters, the candidate needs to be confident with the way he/she is doing the salary negotiation for the skills and abilities that he/she may be providing that company. Similarly, the employer seems to maintain his / her confidence with the figure that he/she have offered to the candidate. Therefore, a pinch of confidence can bring some practicality to the business deals in the form of recruitment. Being enthusiastic is the sense being active during the interview sessions. For example, the candidate is enthusiastic about the job offer by asking certain questions about the duties and responsibilities that the position needs may make a clear impression on the employer that he/she is the right candidate for the job. Taking an active part in a healthy conversation with positive elements may create an atmosphere where the employer may finalize the offer of your own salary expectations. Most of the people may think that researching about the employer before attending an interview is the work of a candidate, but if the scenario is different and the candidate attending the interview is well experienced person in the profession, then the employer need to dig deep with research so that he/she make the candidate take the offer with salary package offered without any further discussions. Both the parties need to come up with an estimation of the range that they need their salary package rely on. While estimating the price range the candidate and the employer need to check with the current market value of the field and the skill needed for the job. And at the end, both the parties need to come with a range with a reasonable salary package, it is not necessary to take the offer right away but making the right offer is something more valuable than taking it. It is important that all the businessmen and the company need to keep in mind that they need to keep emotions away from themselves while making business with something. It would be best if the candidate and the employer never mix their personal and professional emotions together. Being professional and practical while making the salary approach is necessary because emotion creates a lot of tension between people. Therefore, it would be appreciable if the candidate and the employer maintain the professional approach during the interview. As per the above mentioned discussions, it is clear that there are different situations when the employer and the candidate can negotiate salary on their terms. There are some different factors that the employee need to keep in mind on how to ask for salary hike in interview or negotiating a salary hike. Moreover, working for several years the employee may seem a little doubtful about the salary package he/she is receiving from his / her current company. Then it would be best for the employee that he/she should start running some numbers to know more about the current market worth of his / her skill and abilities. Therefore, after doing all the necessary research the employee need to communicate with the employer about the salary hike in a professional manner without making it seem as a big deal. The employee and the employer need to keep an eye on the performance that needs to be appreciated at the end of the financial year with some salary hike or promotion. If the employer fails to do that then the employee has all the right to go ahead and show the employer about the performance, he/she has been given the company for their overall development. And the employer will consider the proposal about the salary hike sooner or later. While making the move about the salary hike the employee need to discuss with the employer that what can be done for the overall development of the company to make sure that it would earn better in coming years. Approach the employer with an idea that the employee can deliver him/her all the details of the future projects which can turn the position of the company in a positive and great manner. Sometimes it happens that the company may not be able to consider the salary hike of the employee and neither they can lose the employee. At that time the employee needs to think positive and still, he / she make things work out in a way that by approaching a certain level of hike with the benefits that the employee is supposed to receive. For example, flexible working hours, better leave policy and better medical plans and much more. There may be a possibility that after working for so many years without any single hike, the employee may get worked up little negative when it comes to the employer’s decision. Therefore, it would be advisable that while approaching the employer, the employee needs to be in the positive state of mind so that they won’t end up being in an offensive conversation. Therefore, approaching the employer in a positive manner can make things better and there is a possibility that even the employer may consider the proposal of salary hike of the employee. While in the middle of the conversation with the employer, the employee may end up resulting in receiving the answer no and at that time instead of being arrogant and rude or threatening the employer, the employee needs to maintain a calm state of mind where he/she can handle the situation better. Sometimes the situation of the company won’t be feasible for the salary hike proposal so it would be appreciated if the employee accepts the rejection in a positive way. However, the bottom line is that these all state of situations and circumstances or ways will help all those people who want salary negotiations in a positive manner. Therefore, all these ways will help those people or candidate to learn more about the negotiating tactics of the salary approach in different status of the job. And similarly, it also provides an idea of all the job approaching candidates to understand more about negotiating salary during their interview.